I love Spring and all the promise that it holds. Finally the sun is shining for longer than it is dark. Each tree and shrub holds on tightly to their buds, until bursting open to reveal blossom and lime green leaves. Daffodils still abound, their bright sunny faces shining, even when the sun is hidden by clouds. 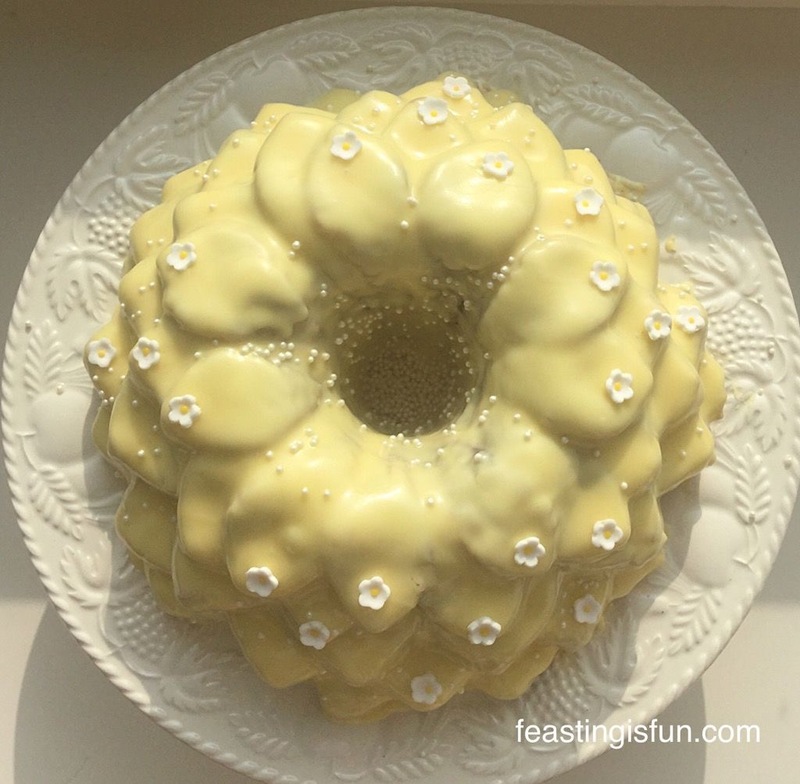 Yellow, for me is a warm happy colour and maybe that’s why I love these Mini Lemon Drizzle Bundt Cakes so much? Does this photograph make you feel happy? It certainly does me! Lemon Drizzle is such a popular cake recipe and for good reason. 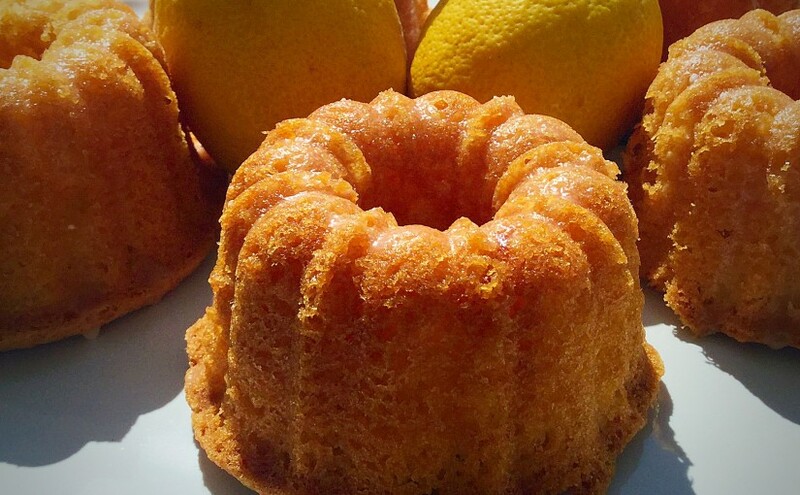 The lemon in cakes wakes up our tastebuds in a sweet/sour heavenly combination. Whether in a large cake thickly drizzled with lemon icing or a thinner icing that soaks into the warm cake, as here in my Lemon Drizzle Cake. There are many different methods and recipes for this delightful fruit and cake combination. 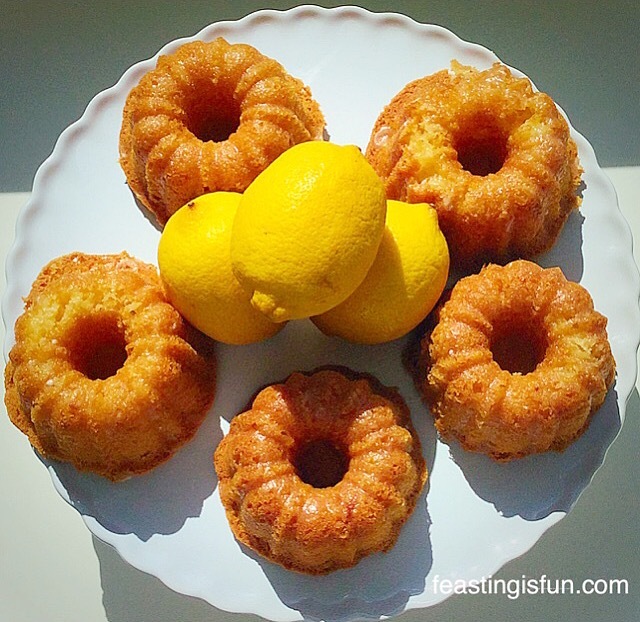 For me though, these Mini Lemon Drizzle Bundt Cakes completely steal the show in terms of cuteness! The correct name for these individual portions of lemony loveliness is Bundtlettes. 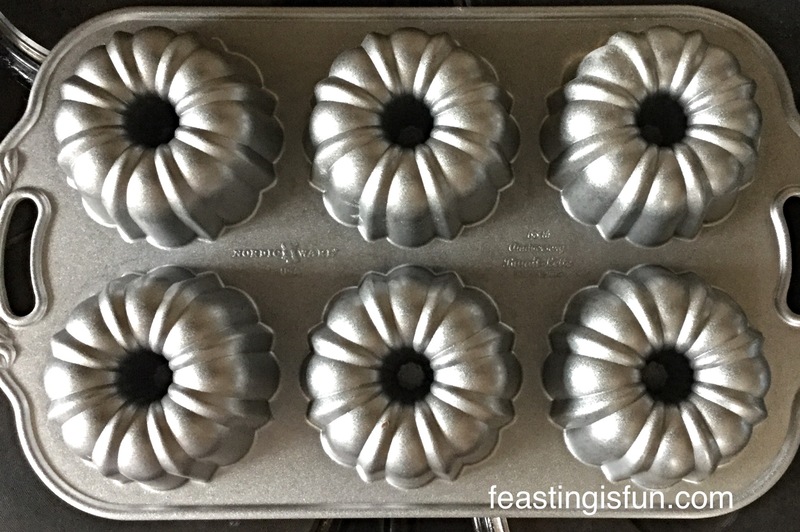 Slightly larger than a cupcake, with a central hole that is a common element of most Bundt cakes, these individual Bundts are adorable. They are certain to create avid conversation amongst whom ever they are served. Remember you only see shadows on a sunny day! 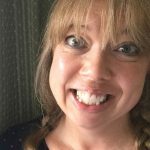 Recently I joined a Food Photography Group on one of the social media platforms – and no I’m not going to say which one! Anyway, photographing my creations is a hugely enjoyable part of food blogging for me. Recently I tweeted that the most ‘cropped out’ feature of my photos were my feet! So in a bid to learn how to improve I joined this group. Well, let’s just say, I don’t think we were of the same mindset! I left after I’d posted my second photograph. It seems that whilst I was more than willing and still am, to learn by constructive criticism, there was a dogmatic sense of what was right or wrong. That’s fine, some people are very black and white, but I certainly did not join the group to be bullied! The reason I mention it, is because, to me and others, the photograph above is perfect, precisely because it is imperfect – I’ll explain. Shadows are bad in food photography, neutral light against a soft background works best. 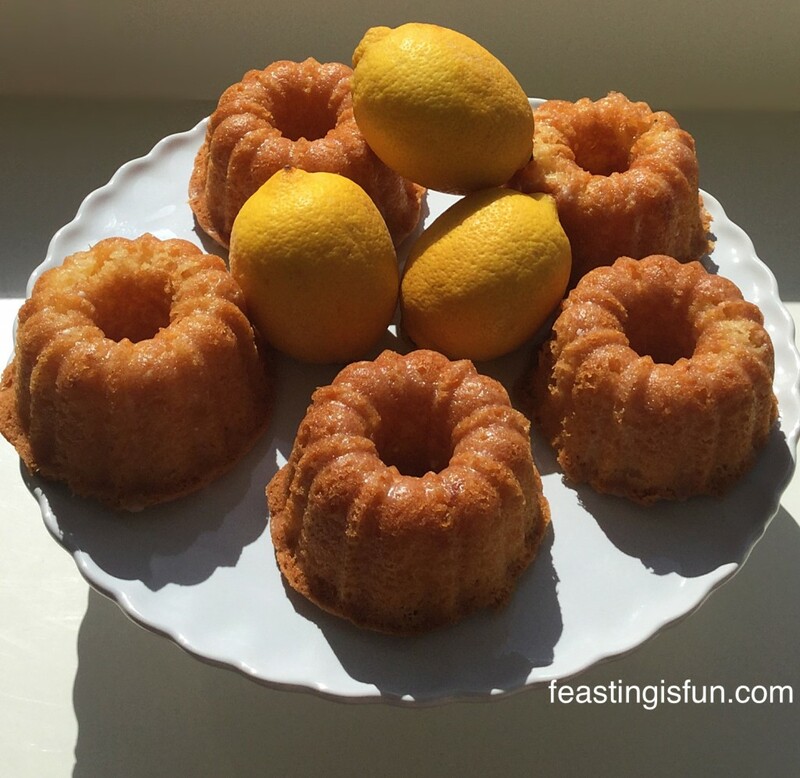 Well maybe, yet it was a gloriously sunny day when I made these Mini Lemon Drizzle Bundt Cakes and through my eyes, that is reflected in the photograph. Beauty is in the eye of the beholder and I hold no resentful feelings against the group. I have giggled over one photo of mine that has received numerous positive comments and shares!! I’m an inclusive person and bullying, whatever the form it takes, will never be allowed to have a place in my life. Alternatively, halvethe quantities if you only want 6. 2 Lemons – scrubbed with a nail brush under hot water if waxed, then zested using a grater/lemon zester and squeezed. First of all, prepare the Bundlette tin by spraying with Cake Release. If you choose to use melted butter, brushed on and then coat in flour – NOTE there is a slight chance that the cakes may stick. I have had mixed results so recommend cake release. In a large bowl add the caster sugar and butter. Whisk/Beat until pale and creamy. Add 1/3 of the dry ingredients and 2 eggs to the butter/sugar. Mix together until just incorporated. Repeat the last 2 steps. Add the final 1/3 of dry ingredients and the zest of 2 lemons. Mix until all of the ingredients are combined. Spoon the lemon cake batter into each individual mould in the Bundlette tin. Fill each mould no more than two thirds full. Smooth the top (actually it will become the bottom!) of each mould with a teaspoon. Place in the middle of the oven and bake for 15-20 minutes. The cake is baked when it is golden brown and springs back from a light touch. Once baked remove the cakes from the oven. Allow to cool for 5 minutes in the tin before turning out onto a cooling rack. Add the juice of 2 lemons and whisk until smooth. Whilst the cakes are still hot, spoon the lemon drizzle over them (saving half for the other 6 Bundlettes). 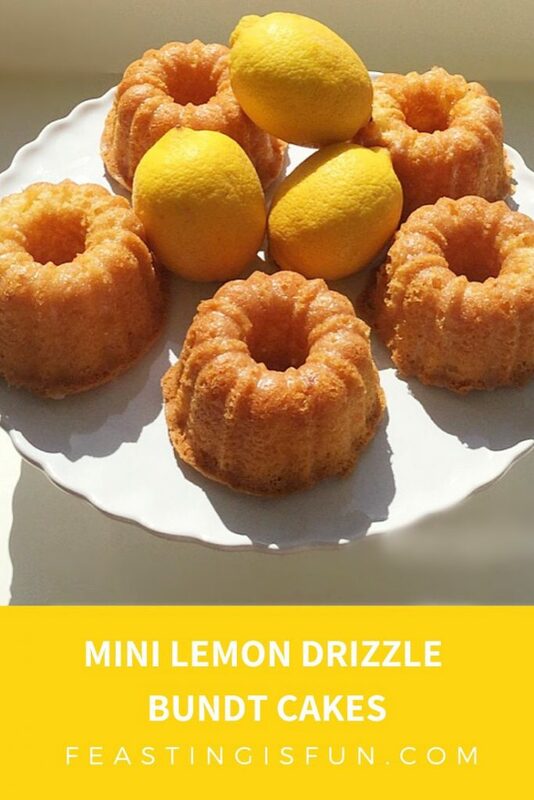 The lemon drizzle will be absorbed into the hot cake and creates a fantastic crunch on cooling. 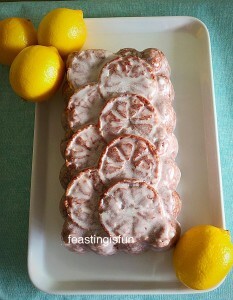 Drizzling the lemon glaze over a hot cake. Rinse the Bundlette tin, dry, prepare, fill and bake the other 6 cakes – spooning the rest of the lemon drizzle over them whilst they are hot. 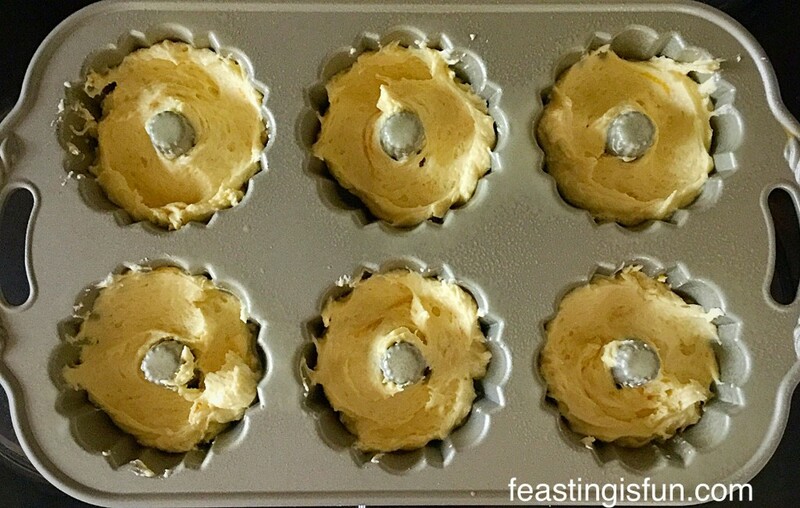 Leave the cakes to cool – if you can wait! 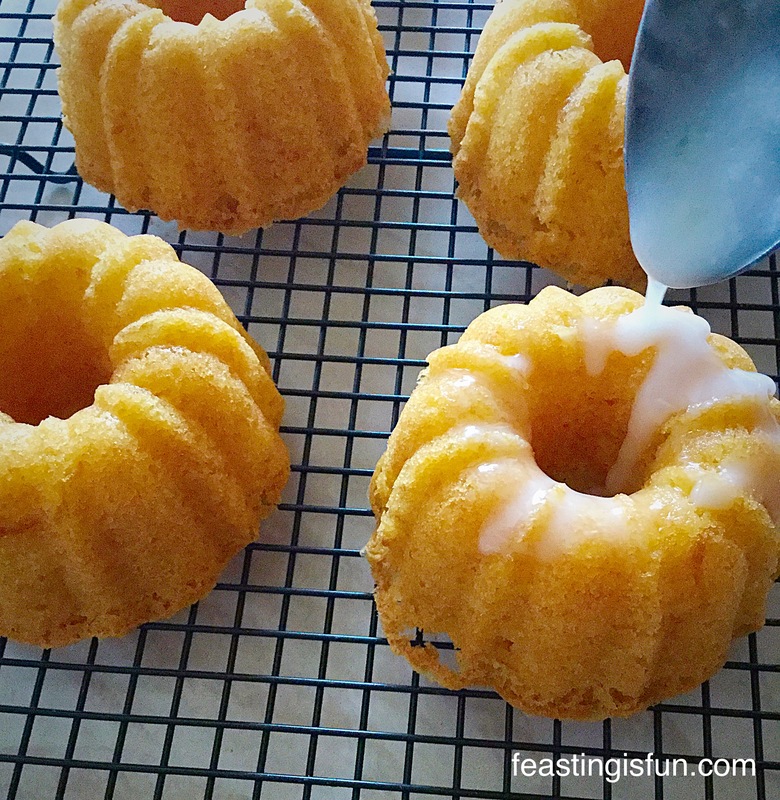 The texture of these Mini Lemon Drizzle Bundt Cakes is wonderful. Beautifully light sponge with the added crunch that comes from the soaked in lemon drizzle. 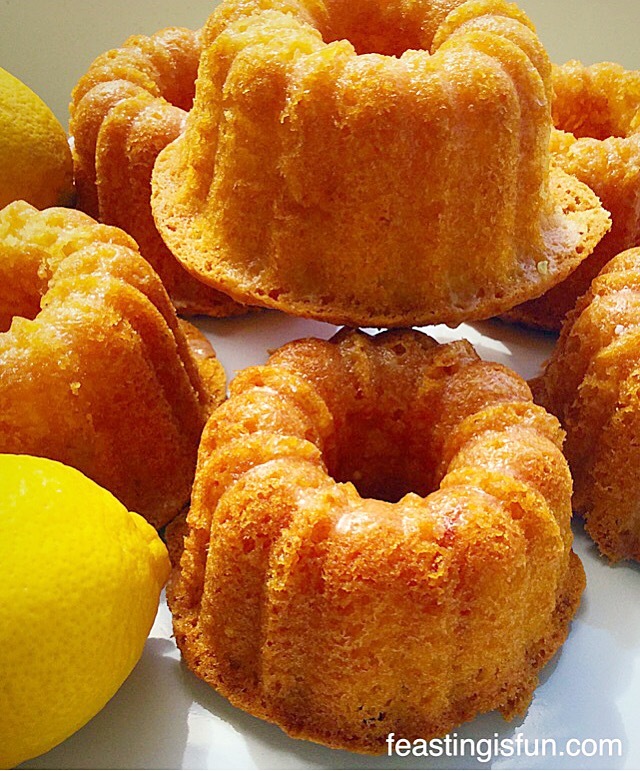 If you like lemon cake I guarantee that you will love these cute Bundlettes! 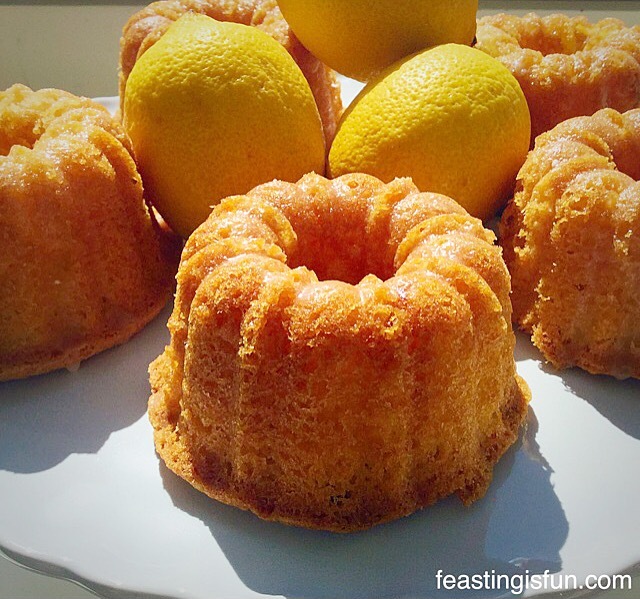 Mini Lemon Drizzle Bundt Cakes perfect portions of sunshine in a cake. With warmer weather promising, these Mini Lemon Drizzle Bundt Cakes are perfect for taking on picnics, afternoon tea in the garden, o just because they taste soo darn good! As soon as the weather warms up I love to spend time in our garden, listening to the birds, watching busy bees going about their business, enjoying the warmth that the sun brings. Oh and trying not to notice all the ‘jobs’ that need doing. I’ve got a trick for that, I just lay down on our swing seat and close my eyes 😉. Do you feel better in yourself when the sun shines and the warmer weather arrives? I know I do! 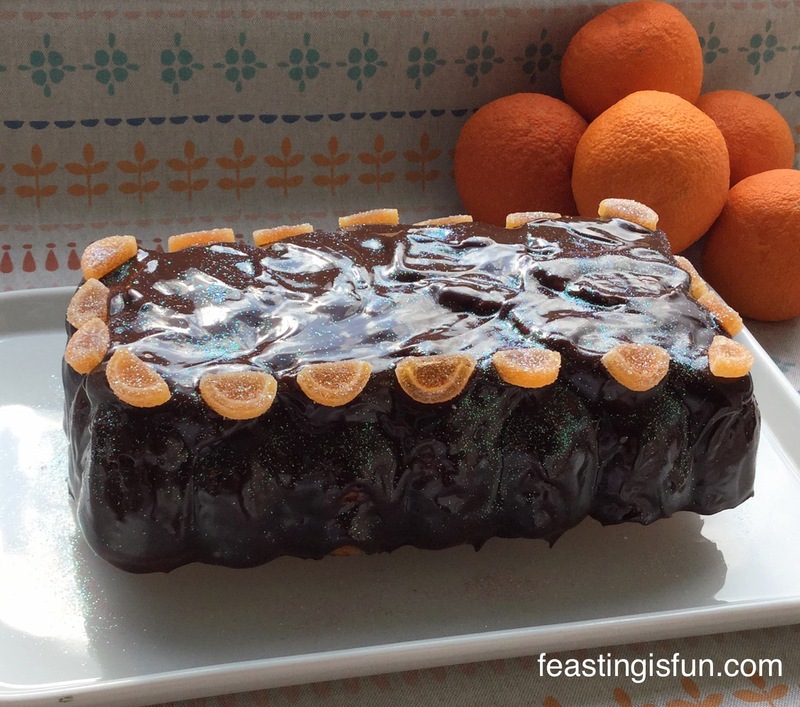 Chocolate Orange Citrus Bundt easy to make and easier to eat! I love baking in the sunshine with the back door open and in the midst of winter with the heating on. Today most certainly is on the chilly side, yet these Mini Lemon Drizzle Bundt Cakes have brought some sunshine indoors! Thank you so much for taking the time to comment, please keep them coming? It is one of the best things about writing Feasting is Fun, interacting with you, my amazing readers. Also I’m on Twitter and Instagram, so put up a photo of your make or bake and tag me in. I love to see what you’re up to in your kitchens and I’ll be sure to give you a shoutout or retweet. Whatever you are doing this weekend, I hope you have lots of fun and enjoy feasting on delicious home cooked food! These look absolutely gorgeous . Is freezing these mini cakes possible with or without the glaze. If freezing without the glaze do you think that after defrosting the glaze will stick.